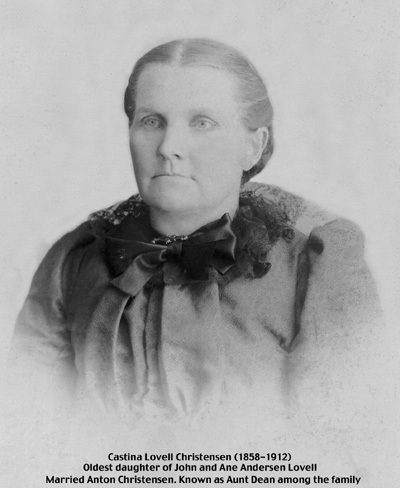 Kirstine (Castina) Lovell Christensen born 6 March 1858 in Fillmore, Utah and died 7 January 1912 in Oak City, Utah. Kirstine married Anthon (Anthony) Christensen 14 April 1873 in Salt Lake City, Utah. Anthon was born 20 Feb 1849 in Ostrup, Vognsild, Aalborg, Denmark. He died 28 June 1916 in Oak City, Utah.